Born in Kretinga, Lithuania, Joselewicz was a colonel of the Polish armed forces, and a participant in the Kosciuszko rising and the Napoleonic Wars. He created a separate Jewish light-cavalry regiment during the insurrection led by Thaddeus Kosciuszko against the Russian partition of Poland in 1794. 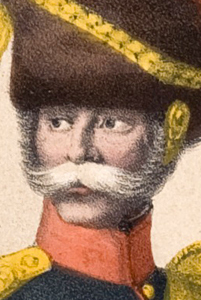 After the insurrection was defeated, Joselewicz fled to France where he served in the cavalry of Napoleon's Polish Legion, where he was promoted to the rank of captain of a dragoon regiment and later awarded the cross of the Légion d'Honneur. During the Austrian campaign in 1809, he commanded two squadrons of Prince Jozef Poniatowski's army. After fierce resistance against the numerically superior Austrian forces, Berek was killed at Kock in May 1809, his death date given as May 8 or 5. Member: Bracia Polscy Zjednoczeni ("United Polish Brethren" Lodge), Warsaw, 1807. Source: Encyclopaedia Judaica, second ed., Macmillan Reference (The Gale Group), 2006�(1972). Image: Juliusz Kossak, "Berek Joselewicz pod Kockiem". 1861. Akwarela. 43 x 36 cm. Litografia.